Corner and L-shaped desks with less-than-ideal mounting space underneath don't have to go without keyboard tray options. 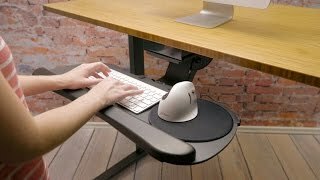 The UPLIFT Keyboard Tray Kit for Corner L-Shaped Desks is the comprehensive system to bring your desk into a new era of working, one that's much more comfortable for you. Limited depth for installing traditional keyboard trays on the right angles of a desktop is a common issue that happens with corner desks. This means you either have to mount a very short track, which would prevent you from fully retracting the keyboard underneath your desk, or you might not be able to mount a keyboard at all. This corner desk keyboard tray system solves this issue easily, by installing a handy corner sleeve to your 90 degree angle, bringing your keyboard closer to you and to your Neutral Reach Zone. Task in a better way with the Keyboard Tray Kit for Corner L-Shaped Desks from UPLIFT. An ergonomic keyboard tray gives you the freedom to adjust the height and tilt of your keyboard independently from the desk and also relieves the strain caused by over-reaching to type. The UPLIFT Large Keyboard Tray comes with one, 27'' wide surface for your keyboard and mouse to sit side-by-side. All necessary mounting hardware is included, including a 21'' track and an 11'' track that you can use in the event that you decide to mount the keyboard tray in a limited depth area. For those who prefer more flexibility, the UPLIFT Switch Keyboard Tray comes with two surfaces: a 19.75'' wide platform for the keyboard and a separate 9'' diameter surface for the mouse. The mouse platform can easily move to the left or right side for ambidextrous mousing, and is also depth adjustable. The E3 Keyboard Tray by UPLIFT Desk provides a large space with enough room for both your keyboard and mouse. Ergonomic adjustments abound in this budget-friendly tray, including positive and negative tilt and the ability to lower the tray to 4.33 inches below the surface of your desk using a lever located on the mechanism. The UPLIFT Corner Sleeve is available in two sizes, to fit any desktop between 1'' and 2.5'' thick. Quality and fabrication is EXCELLENT! The movement is smooth and precise to wherever you want to position the tray. $188.00 List Price: $455.00* The list price is the same as the MSRP (Manufacturer's Suggested Retail Price). It may not necessarily be the price at which the product is sold.